Persuasive Robotics Talk At The Emotional Machines Conference | Christoph Bartneck, Ph.D. I was invited to give a talk at the Interdisciplinary Conference on Emotional Machines in Stuttgart on September 21st, 2017. My talk focused mainly on the work I did in collaboration with Jürgen Brandstetter (doi: 10.1145/2909824.3020257, doi: 10.1177/0261927X15584682, doi: 10.1109/IROS.2014.6942730). My main argument was that the number of robots in our society will increase dramatically and robots will participate in the formation of our language. Through their influence on our language they will be able to nudge our valence related to certain terms. Moreover, it will only take 10% of us to own a robot for them to dominate the development of our language. 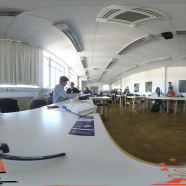 This is also the first time I used a 360 degree camera to record a talk. This technology becomes particularly useful when following the discussion between the speaker and the audience. YouTube’s 360 video feature does not work in all web browser (e.g. it does not work with Safari). Chrome and Firefox should be fine.